As we say goodbye to 2008, Malaysians can look back at the momentous events of March 8 general elections that not only transformed the political landscape of our country but changed the mindset and perceptions of ordinary citizens. This paradigm shift is the real and significant transformation that we can see, touch and even feel. Who would have thought it possible that ordinary citizens can combine in one overwhelming force to move barriers and remove governments in five states? Who would have thought that UMNO’s choice for Menteri Besar in states ruled by them could be easily over-ruled? Who would have thought that Sabah and Sarawak can demand and force the Federal government to acquiesce to their just demands? Umat Islam sekali lagi menyambut Tahun Baru Hijrah pada tahun ini. Kali pertama adalah pada 10 Januari lalu dan kini pada 29 Disember, umat Islam merayakan sekali lagi Ma’al Hijrah 1430 dengan penuh semangat dan azam baru. Dengan rasa rendah hati saya mengucapkan salam Ma’al Hijrah buat semua umat Islam di mana sahaja berada, semoga azam untuk sama-sama hidup mesra dan aman dengan rakyat Malaysia berbilang bangsa diteruskan dengan jujur dan ikhlas. Walaupun suasana aman di negara kita, saya amat sedih dengan keadaan saudara kita di bumi Palestin yang mana lebih 200 orang terbunuh manakala beratus lagi cedera akibat serangan jet pejuang Israel di Gaza dua hari lalu. Saya bagi pihak DAP mengutuk sekeras-kerasnya serangan Israel terhadap orang awam dan mendesak Israel supaya menghentikan tindakan ganas serta mencari jalan penyelesaian melalui usaha damai. I would like to wish everyone a Merry Christmas and to share with all Malaysians that Jesus Christ’s message of peace, love and freedom is still dear to my heart. For me, the spirit of truth, justice, equal opportunity and salvation from sin is not merely an ideal but something we must strive for. Having said that, it is sad to note that despite my last year’s Christmas message – calling on the federal government to stop intimidating the Catholic weekly newspaper ‘Herald’ by demanding the publication to drop the use of the word “Allah” in its Malay language section – is still not heeded. Despite the Federal Constitution guaranteeing freedom of expression and freedom of worship for all including non-Muslims, the Barisan Nasional government still refused to stop its suppression of press freedom and people’s fundamental human rights. Bersyukur kita kerana dapat bersama-sama berkumpul di majlis yang penuh warna-warni dan meriah ini bagi menyaksikan Perarakan Chingay, Tarian Singa dan Naga 2008. Ia merupakan acara utama yang mengisi kalendar Pesta Pulau Pinang sejak beberapa tahun lepas. Bagi pihak Kerajaaan Negeri Pulau Pinang suka untuk saya merakamkan ucapan setinggi-tinggi penghargaan kepada Tuan Yang Terutama Tun kerana sudi melapangkan masa bagi bersama-sama dengan kita menyaksikan kemeriahan program malam ini. Untuk makluman Tuan Yang Terutama Tun dan tuan-tuan serta puan-puan sekalian, buat julung kalinya program ini diadakan pada hari ini tidak seperti pada tahun-tahun yang lepas di mana perarakan ini diadakan pada 25 haribulan Disember iaitu bersamaan dengan Hari Krismas atau Hari Natal. Kerajaan Negeri memutuskan untuk tidak mengadakan program ini pada Hari Krismas berikutan terdapat banyak aduan daripada pelbagai pihak pada program tahun-tahun lepas berkenaan dengan masalah kesesakan lalulintas. Saya difahamkan perarakan pada tahun ini bermula dari Padang Brown, Datuk Keramat dan berakhir di sini. Saya juga difahamkan bahawa perarakan kali ini akan diketuai oleh brass band dari St Xavier’s Institution dengan disertai oleh 10 pasukan chingay, 10 pasukan tarian singa, 2 pasukan tarian naga, pasukan tarian kebudayaan Melayu, India dan Punjabi serta diserikan dengan lima pemenang utama Miss Pesta Pulau Pinang 2008 yang akan menaiki beca berhias khas. Bukan itu sahaja, saya juga turut dimaklumkan bahawa pada malam ini juga berlansungnya dua acara iaitu pertandingan menghias beca dan hiasan tarian singa. Pemenang bertuah akan membawa pulang wang tunai RM1,500 bagi tempat pertama, RM1,200 kedua dan RM800 ketiga. Service of the Funicular train on the upper stretch of Penang Hill was stopped since 25 June 2008 due to protrusion of various wires from the cable. Protrusion of -wires was seen since 2008 and minor repairs were carried out by it was on 25 June 2008 that the cable supplier had advised total stop to the service and replacement of a new cable is necessary when more and more wires protruded. The State Government has to find its own resources to replace the cable as the Federal Government was not funding the cost of this repair on the basis that upgrading work of RM40million has been approved. The State Government had hoped that the upgrading work by the Federal Government can be done quickly but when there was no indication of any progress, the state government had no choice but to repair at its own cost. The absence of funding from the Federal Government and the various bureaucratic protocols impeded the earlier commencement of the train service. Turnkey quotations of RM1.463 million, RM1.32 million and RM920,000 were received for evaluation which would require 6 month to install. 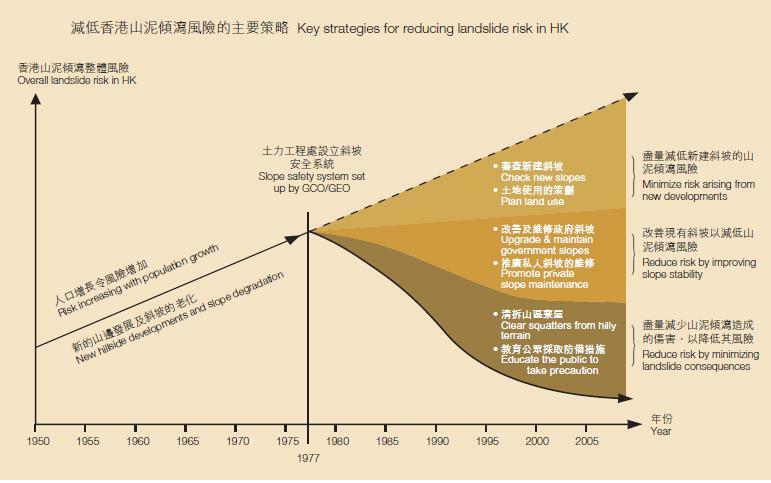 The Federal Government should emulate the Hong Kong government to set up Geotechnical Engineering Office (GEO) to spearhead the upgrading and maintenance of the slopes as well as promoting public awareness to improve slope safety, as a pre-requisite to land development for building and infrastructure construction. Slopes are found in many states amidst urban developments especially Penang. It is essential that they are properly maintained and landscaped to enhance the city outlook. The Hong Kong government learnt their lessons from repeated fatal landslide disasters which took more than 470 lives 30 years back. They set up Geotechnical Engineering Office (formerly called Geotechnical Control Office) of the Civil Engineering and Development Department , they also set up a comprehensive Slope Safety System to reduce landslide risk to as low as practically achievable. Today, they have successfully reduced the landslide risk; this is reflected in the substantial drop in the landslide fatality rate. How many more Highland Tower and Bukit Antarabangsa tragedies do we need to experience before the government takes measures and precautions such as those practiced in Hong Kong? Protect Workers Rights By Cancelling The RM 5 Billion Injection Of EPF Funds Into Valuecap Following The Federal Government’s Failure To Convince EPF Members That It Will Not Be Used To Bail Out Politically-Connected Parties. I have received many queries and expressions of concern by workers from Penang about the security of the government injecting RM 5 billion of Employees Provident Fund(EPF) into the Valuecap Sdn Bhd investment fund to buy under-valued stocks. Deputy Prime Minister Datuk Seri Najib Razak should reveal the full list of shares bought from the RM5 billion EPF injection, to assure the public that the monies will not be used to bail out politically connected companies. Najib’s failure to do so has only strengthened public demands that the Federal Government proves its protection of workers rights by cancelling the use of RM 5 billion of EPF funds for Valuecap Sdn Bhd. So far, the public does not know whether the value of the shares bought by the RM 5 billion funds have increased. DAP Opposes The Judicial Appointments Commission (JAC) Bill That Does Not Promote Judicial Independence And Affects The Constitutional Rights Of Sabah And Sarawak In The Appointment Of Judges. Similarly, DAP opposes the JAC bill that does not promote judicial independence and affects the constitutional rights of Sabah and Sarawak in the appointment of judges, including the Chief Judge of Borneo. The JAC is still a body controlled by the Prime Minister who decides not only appointments of its members but also who to recommend for consideration. There have been concerns that by establishing a new body that decides on judicial appointments, Sabah and Sarawak’s rights have been affected without due consideration to the constitutional provisions under Article 122B and Article 161E(2)(b). These two articles in the Federal Constitution serves to preserve, protect and promote the rights of Sabah and Sarawak over the appointment, removal and suspension of judges for the High Court of Sabah and Sarawak. In other words the rights of Sabah and Sarwawk are not consulted or taken into account as required under the Federal Constitution as agreed to when Sabah and Sarawak joined to form Malaysia in 1963. Excerpt from Speech During The DAP Sarawak State Annual Convention In Kuching On 14.12.2008. The Malaysia Anti-Corruption Commission (MACC) Bill Should Outlaw Closed Or Negotiated Tenders And Clause 58 Amended Or Removed So That The Public Prosecutor or Attorney-General (AG) Can Not Interfere In The Prosecution Of Corruption Cases By The MACC. The MACC Bill should outlaw closed or negotiated tenders and Clause 58 amended of removed so that the Attorney-General can not interfere in the prosecution of corruption cases by the MACC. Clause 58 states that a prosecution for an offence under the MACC Act “shall not be instituted except by or with the consent of the Public Prosecutor(AG)”. DAP opposes clause 58 to establish the MACC Chief Commissioner’s sole powers of the prosecution to ensure MACC’s independence from executive interference and the integrity of its investigations without external influence. Even though DAP is inclined to support the MACC, the removal or amendment of Clause 58 would go a long way towards full and unqualified support from the public. DAP proposes a RM 50 billion economic stimulus plan to fight the recession instead of BN’s puny RM 7 billion plan that Malaysians cannot see, can not touch and can not feel. No one knows how this BN RM 7 billion expansionary economic plan is going to help 27 million ordinary Malaysians. What we know is that the few BN cronies will benefit from a failed system that permits financial malpractices and abuses of power. Malaysia economic growth in the third quarter this year, with a real gross domestic product (GDP) growth of 4.7% compared with 6.3% and 7.1% in the second and first quarter, respectively, is the lowest quarterly growth in three years. The BN government must wake up from its denial mode that Malaysia will not slip into recession following the global financial crisis. Malaysia must follow China’s aggressive fiscal and monetary measures of both fighting the oncoming economic recession and looking beyond towards economic recovery. China announced the largest economic stimulus plan of USD 586 million over 2 years. However its 30 local governments has announced a larger USD 3.5 billion spending over 5 years. With total USD 4 trillion spent by China, this is almost double its international reserves of USD 2 trillion. Ketua Menteri Pulau Pinang, Y.A.B Tuan Lim Guan Eng menegaskan bahawa peruntukan pembangunan Persekutuan yang disalurkan oleh Kerajaan Persekutuan kepada Negeri Pulau Pinang seharusnya setara dengan cukai yang dibayar oleh rakyat negeri ini. Menjawab kepada soalan lisan Lim yang juga Ahli Parlimen kawasan Bagan di Dewan Rakyat, Timbalan Menteri di Jabatan Perdana Menteri, Y.B. 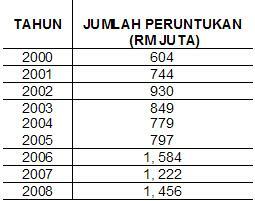 Dato’ Mohd Johari Bin Baharum menjelaskan bahawa peruntukan pembangunan Persekutuan yang telah disalurkan kepada Negeri Pulau Pinang dari tahun 2000 hingga tahun 2008 adalah sebanyak RM8.965 bilion. Lim menekankan bahawa jika dibandingkan peruntukan Kerajaan Persekutuan tersebut dengan cukai yang dibayar oleh rakyat Pulau Pinang dari tahun 2001 hingga 2007 seperti yang dimaklumkan oleh Timbalan Perdana Menteri merangkap Menteri Kewangan, Datuk Seri Najib Tun Razak ketika menjawab soalan lisan Lim di Dewan Rakyat, rakyat negeri ini telah membayar cukai sebanyak RM15.619 bilion – lebih kurang dua kali ganda daripada jumlah peruntukan yang disalurkan. Today is a special occasion where the global community celebrates the 60th anniversary of the United Nations’ Universal Declaration of Human Rights. Unfortunately for us in Malaysia, despite claiming to be a progressive and advanced society, we are still lagging behind in protecting and upholding human rights. After more than 50 years of independence, human rights are mere lip service offered by the Barisan Nasional government. 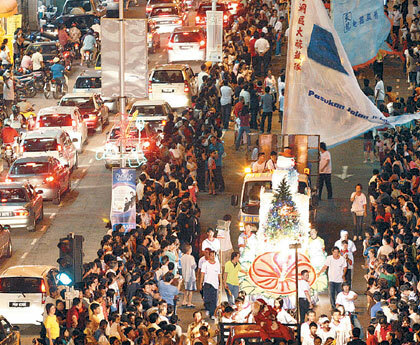 Recent events, particularly after the historic political tsunami of March 8, have shown that the authorities lack of respect for human rights. Selective prosecutions and persecutions are still being enforced despite the end of Mahathir era. How Asia Can Have A Sustainable Future? Speech By Penang Chief Minister Lim Guan Eng During The 4th Asia Economic Summit Jointly Organised By The Asia Society And Asian Strategy & Leadership Institute(ASLI) In JW Marriott Hotel, Hong Kong On 9.12.2008. Eight Measures To Transform Penang From A Sweat Shop To A Smart Shop And Reinvent The Economy For Sustainable Growth And Prosperity. The theme of the 4th Asia Economic Summit of “Reinventing Asian Economies for Sustainable Growth & Prosperity” is apt and timely following the global financial crisis that has threatened both the growth and prosperity of both developed country and emerging economies. There is also a need to reinvent as the conditions that made prosperity and growth possible either do not exist or are not applicable any more. The most popular measures to counter the current recession includes an expansionary budget and government guarantees for financial institutions. However we need to look beyond the recession and be bold enough to undertake fundamental reforms and reinvent the economy to allow Asia is to continue enjoying sustainable growth and prosperity. Asia is too diverse to be presented in a singular case. So allow me to present the perspective of Penang, the problems, successes and failures of a middle income state. Penang is a key trading post that successfully evolved into one of the largest electronics manufacturing hub in the world during the last century. Penang’s success from the 70s to the 80s made Penang the leading state in Malaysia with GDP per capita of RM 28,851, double that of Malaysia at RM 19,189 for 2008. Despite being the second smallest state in Malaysia and with a population of only 1.4 million, Penang’s exports alone amounted to 27% of Malaysia’s total exports. Umat Islam di seluruh dunia hari ini menyambut Aidil Adha atau turut dikenali dengan Hari Raya Korban dan Hari Raya Haji. Hari Raya Korban kali ini disambut pada 10 Zulhijjah 1429 Tahun Hijrah di mana jutaan umat Islam turut menunaikan ibadah Haji di Makkah. Saya dengan ini mengucapkan salam Aidil Adha buat semua umat Islam di Malaysia dan di mana sahaja berada atas nama persaudaraan sesama insan dan semangat merapatkan tali silaturrahim. Malaysians would consider it irresponsible and immoral for the Federal Government or any other party to earn RM 16 million a day at the people’s expense by merely manipulating petrol prices that does not reflect the plunging international price of oil which is currently at around USD 40 per barrel. Since July 11 when a barrel of oil hit a record $147.27, oil has fallen 72% to USD 40.81 per barrel in less than five months, The expected economic recession following the global financial crisis has caused the drop in petrol prices to its lowest level in four years since December 2004. A front-page report in The Star estimated The Government is set to get windfall gains of up to RM 16 million per day based on crude oil price of US$44 per barrel and a consumption estimate of 27.5 million litres per day. This would work out to extraordinary gains of RM 6 billion a year at the expense of Malaysians. But for whose benefit?